Break Up [We Need to Talk] was devised by the company, based on material which previously appeared in Animal Hour (2010). 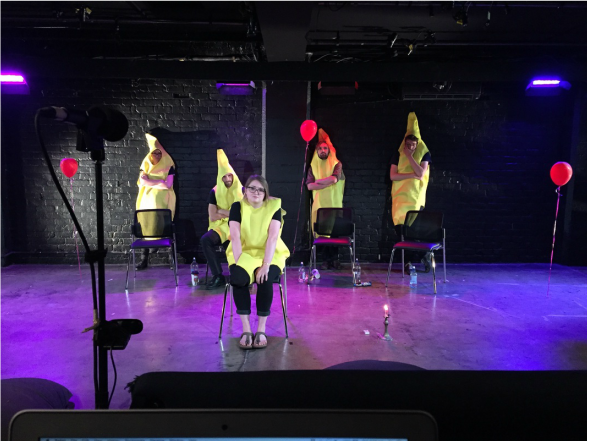 There’s no easy way to do this… Five performers, five hours, one desperate conversation. Join Binge Culture as they lovingly create and destroy an entire relationship from scratch. Come and go as you please to witness the desperation, negotiation, devastation and emotional blackmail. #bingebreakup. Highly Commended for "Most Original Concept" New Zealand Fringe 2014. "At 0100 on Sunday morning, when Binge Culture finally throws in the towel, the venue is packed. People are sitting on the floor in front of the seats and standing two rows deep behind them. As a person who typically shuns performances longer than 90 minutes, I am surprised to find myself and so many others still gazing on with rapt attention after six hours of watching Binge Culture perform a single action that people now often perform with a single text message: 'breaking up.'" "Binge Culture are one of New Zealand’s most interesting devisors and with We Need to Talk they’ve managed to create something that perfectly encapsulates the excruciating journey of break-ups into something that ultimately feels like a celebration of love’s painful conclusion." "...the non-scripted dialogue is packed with comedic gems and heart-breaking moments. Add to this the tagging in and out of the hot seat character, and one can only conclude that this show is an example of story-tellers in their prime and zone."